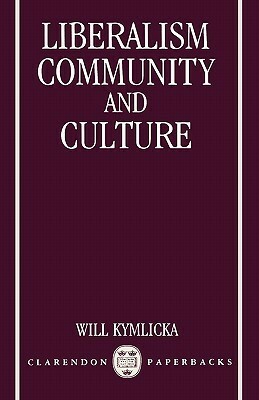 Kymlicka is in the deontological, Rawlsian tradition of liberal theory. So immediately I have some problems with him. As such, although he appears sympathetic to some consequentialist strains of moral justification at the beginning of the work, it's mostly straight-up Kantian ethics and largely critical of utilitarian-based approaches. Most of the book, however, deals with arguments relating to minority/group rights rather than abstract ethical theory, and then a liberal defense of such rights in the wake of countless communitarian critiques of liberalism. In this I think WK succeeds, and I can accept many of his conclusions while, at the same time, rejecting his deontology. Apart from defending minority rights specifically from a liberal perspective, I would say that he's also successful in defending liberalism from communitarian critiques (although I'm not yet familiar with the responses that communitarians have presumably given to WK, so that's only a tenative conclusion). This was written years ago but it was useful in better understanding many arguments and points of view regarding liberalism as atomistic or more communal. Will Kymlicka - Will Kymlicka received his B.A. in philosophy and politics from Queen's University in 1984, and his D.Phil. in philosophy from Oxford University in 1987. He is the author of seven books published by Oxford University Press: Liberalism, Community, and Culture (1989), Contemporary Political Philosophy (1990; second edition 2002),Multicultural Citizenship (1995), which was awarded the Macpherson Prize by the Canadian Political Science Assocation, and the Bunche Award by the American Political Science Association, Finding Our Way: Rethinking Ethnocultural Relations in Canada (1998), Politics in the Vernacular: Nationalism, Multiculturalism and Citizenship (2001), Multicultural Odysseys: Navigating the New International Politics of Diversity (2007), which was awarded the North American Society for Social Philosophy’s 2007 Book Award, and Zoopolis: A Political Theory of Animal Rights (2011), co-authored with Sue Donaldson, which was awarded the 2013 Biennial Book Prize from the Canadian Philosophical AssociationHe is also the editor of Justice in Political Philosophy (Elgar, 1992), and The Rights of Minority Cultures (OUP, 1995), co-editor with Ian Shapiro of Ethnicity and Group Rights (NYU, 1997), co-editor with Wayne Norman of Citizenship in Diverse Societies (OUP, 2000), co-editor with Simone Chambers of Alternative Conceptions of Civil Society (PUP, 2001), co-editor with Magda Opalski of Can Liberal Pluralism Be Exported? (OUP, 2001), co-editor with Alan Patten of Language Rights and Political Theory (OUP, 2003), co-editor with Baogang He of Multiculturalism in Asia (OUP, 2005), co-editor with Keith Banting of Multiculturalism and the Welfare State: Recognition and Redistribution in Contemporary Democracies (OUP, 2006), co-edior with William M. Sullivan of The Globalization of Ethics: Religious and Secular Perspectives (Cambridge UP, 2007), and co-editor (with Bashir Bashir) of The Politics of Reconciliation in Multicultural Societies (OUP, 2008), co-editor with Avigail Eisenberg of Identity Politics in the Public Realm: Bringing Institutions Back In (UBC Press, 2011), co-editor with Kathryn Walker of Rooted Cosmopolitanism: Canada and the World (UBC Press, 2012), and co-editor with Eva Pfostl of Multiculturalism and Minority Rights in the Arab World (OUP, 2014).He is currently the Canada Research Chair in Political Philosophy at Queen's University, and a visiting professor in the Nationalism Studies program at the Central European University in Budapest. His works have been translated into 32 languages. He is a Fellow of the Royal Society of Canada, of the Canadian Institute For Advanced Research, and a Corresponding Fellow of the British Academy. From 2004-6, he was the President of the American Society for Political and Legal Philosophy.